I moved away from Southeast Texas in the mid-90's. Since that time, I've enjoyed going back and visiting now that I have perspective. I really like going down to Port Arthur and driving along Procter St. downtown. There's not really anything going on down there but there are several abandoned night clubs. One of them was the Lion's Den. It had an awesome neon sign out front that featured a very cool lion. Moon Mullican mentions this club in "Seven Nights To Rock". Several years ago, they removed that sign and I remember seeing it in the "sign graveyard" in Beaumont. I really wish I would have done something and tried to get that sign. 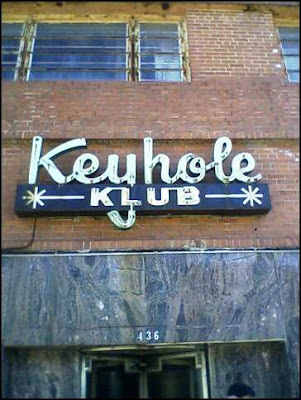 Another cool club--or should I say "klub"?--down there is the Keyhole Klub. The sign is still up at the moment. The club features a revolving glass door for an entrance. I've peered through the scratched up glass of that door every time I go down there. It looks like somebody locked the place up in the 70's and it hasn't been touched since that time. All the bar stools are still lined up at the bar. If I had the money, I would make a pitch for getting the sign and all the bar fixtures.